There are a lot of homes in the Annex neighbourhood with turrets but most of the towers are small unlike this one which looks quite large so that you could actually have some major space in there. 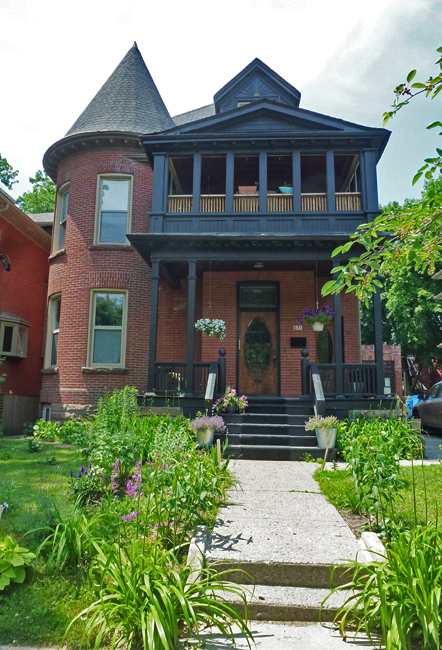 This house was built in 1908 in the Queen Anne Style and has heritage protection as well as being in a Heritage Conservation Area. Wouldn't you like to see how they have decorated inside that turret? I love houses like this. I wish I could see what the rooms inside that turret look like. Hello, I love the house and the turret! Happy Thursday, enjoy your day! Beautiful architecture. There's the odd place here that feature turrets. Beautiful! I hope its a reading nook or sitting area. I like this house. I'd love to see the inside of this beauty. Yes I would! But you probably remember I usually comment on wanting to see the insides of everything! Turrets are curious. They must be hard to figure out how to decorate and use.